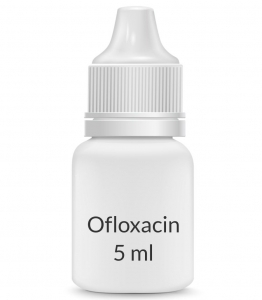 USES: Ofloxacin is used to treat outer ear infections (swimmer's ear or ear canal infections) and middle ear infections. It works by stopping the growth of bacteria. This medication belongs to a class of drugs called quinolone antibiotics. This medication treats only bacterial ear infections. It will not work for other types of ear infections. Unnecessary use or overuse of any antibiotic can lead to its decreased effectiveness. HOW TO USE: Read the Patient Information Leaflet that comes with this product. Consult your doctor or pharmacist if you have any questions. For accuracy and to avoid contamination, have another person give the drops if possible. Hold the container in your hand for a few minutes to warm it. This will minimize dizziness. To apply ear drops, wash your hands first. To avoid contamination, do not touch the dropper tip or let it touch your ear or any other surface. Lie on your side or tilt the affected ear upward. Place the dropper directly over your ear and administer the prescribed number of drops. If you are using the single-use containers, empty the contents of the prescribed number of containers into your ear. For outer ear infections, to help the drops roll into the ear, adults should hold the earlobe up and back. In children, hold the earlobe down and back. For middle ear infections, gently press down several times on the cartilage that partially covers your ear opening to allow the drops to enter your middle ear (see Patient Information Leaflet). Keep your head tilted for about 5 minutes, or insert a soft cotton plug if so directed. Repeat the above steps for your other ear if so directed. Do not rinse the dropper. Replace the dropper cap on the bottle after each use. If you are using the single-dose containers, discard any unused solution after each application. Do not reuse. Use this medication regularly in order to get the most benefit from it. Remember to use it at the same time(s) each day. Continue using it for the full time prescribed, even if symptoms disappear after a few days. Stopping this medication too early may allow bacteria to continue to grow, which may result in a relapse of the infection. Inform your doctor if your condition does not improve in 1 week. Report any ear discharge that occurs after the treatment period is completed. Do not use in the eye. SIDE EFFECTS: Mild irritation/discomfort in the ear, dizziness, headache, earache, or changes in taste may occur. If any of these effects persist or worsen, notify your doctor or pharmacist promptly. Remember that your doctor has prescribed this medication because he or she has judged that the benefit to you is greater than the risk of side effects. Many people using this medication do not have serious side effects. Tell your doctor immediately if any of these unlikely but serious side effects occur: tingling/numbness. Tell your doctor immediately if any of these rare but very serious side effects occur: hearing changes. Use of this medication for prolonged or repeated periods may result in a new fungal ear infection. Do not use it for longer than prescribed. Contact your doctor if you notice new or worsening symptoms. A very serious allergic reaction to this drug is unlikely, but seek immediate medical attention if it occurs. Symptoms of a serious allergic reaction may include: rash, itching/swelling (especially of the face/tongue/throat), severe dizziness, trouble breathing. This is not a complete list of possible side effects. If you notice other effects not listed above, contact your doctor or pharmacist. In the US - Call your doctor for medical advice about side effects. You may report side effects to FDA at 1-800-FDA-1088. In Canada - Call your doctor for medical advice about side effects. You may report side effects to Health Canada at 1-866-234-2345. PRECAUTIONS: Before using ofloxacin, tell your doctor or pharmacist if you are allergic to it; or to other quinolone antibiotics (e.g., ciprofloxacin, levofloxacin); or if you have any other allergies. This product may contain inactive ingredients (such as preservatives like benzalkonium chloride), which can cause allergic reactions or other problems. Talk to your pharmacist for more details. Before using this medication, tell your doctor or pharmacist your medical history, especially of: other ear problems, two or more ear infections within 6 months. This drug may make you dizzy. Do not drive, use machinery, or do any activity that requires alertness until you are sure you can perform such activities safely. Limit alcoholic beverages. This medication should be used only when clearly needed during pregnancy. Discuss the risks and benefits with your doctor. It is unknown if this medication passes into breast milk. However, it is unlikely to harm a nursing infant. Consult your doctor before breast-feeding. NOTES: Do not share this medication with others. This medication has been prescribed for your current condition only. Do not use it later for another infection unless told to do so by your doctor. A different medication may be necessary in those cases. It is important to keep the infected ear(s) clean and dry. Try not to get the infected ear(s) wet when bathing. Avoid swimming unless your doctor tells you otherwise.